NaviaTec DP-359, 3,0m Display port plug to HDMI plug cable. 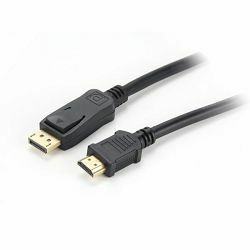 Converts DisplayPort signals to HDMI signals. Display port version 1.2. Max resolution 4K*2K. Black cable with gold colored plugs.